I finally got around to going to look at the new Myki gates at Springvale station the other day. They’ve also been installed at Mitcham, and will be put in at Richmond soon. From what I’d heard, they are faster than the existing older Myki gates installed in 2012-13. The stories were true. They are faster. Looking at the video frame-by-frame, my totally unscientific comparison shows that the new gate is about twice as fast as the old one. The older Myki gates are notorious for inconsistent speeds, with just the reader response sometimes taking several seconds — the video above shows the gate on a “good day”. Response times are arguably the Myki system’s biggest single problem (of many), affecting hundreds of thousands of users every day, causing long queues at many stations. Hopefully these new gates will be consistently fast. At present they’re showing the kinds of speeds the system should have had all along, and more in line with other smartcard fare systems such as Brisbane’s Go Card and Perth’s Smartrider. The new design omits displaying the balance and fare, I assume to discourage people from lingering. They can instead check their balance at a vending machine or Myki Check (blue reader), as well as online of course. The new gates seem to have been provided by Vix (ERG), who ran the Metcard system, and also developed much of the Hong Kong Octopus smartcard system. Perhaps, just perhaps, they know more about designing and implementing public transport ticketing smartcards than Kamco, who implemented most of Myki. Vix also seem to have taken over maintenance of the system in recent weeks, though a full re-tender of the operating contract is expected to go ahead in coming years. 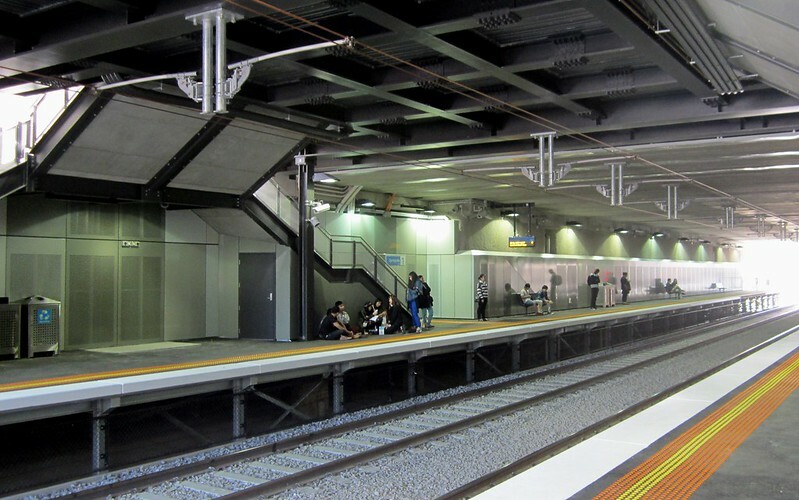 It might also be that this is the first example of the Victorian government’s (under Labor) insistence on “open architecture” — that is, that the various components of the Myki system had to have documented interfaces, so that other vendors could come along later and build on it incrementally. But it’s not clear how this came about — did the Coalition approach Vix, or did Vix come up with a proposal? What’s unknown is if more new faster equipment will replace the thousands of existing slow devices around the network. While it’d be nice to see consistently faster response times, it would cost a small fortune — on top of an already extremely expensive system. What might be better, as I’ve raised before, is for someone (Vix?) to re-write the software that runs on the existing hardware. Bonus video: 30 seconds of the gates in use at Springvale, so you can see my fast touch wasn’t a fluke. Note the curious occurrence, about 20 seconds in, of the lady who touches both left and right — apparently to let her friend through, presumably with a different card, as you’d expect the gates to reject the one card being used twice. Also note the double-width gate has been left open, in the absence of a staff member. 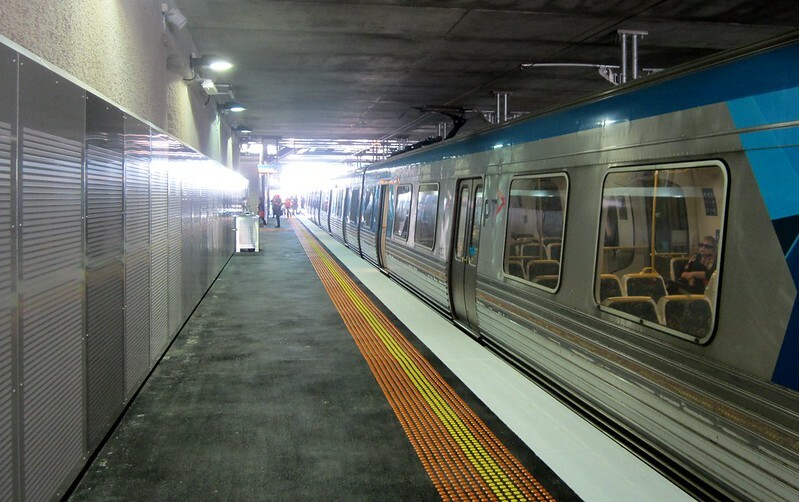 The new Springvale station opened earlier this week as part of the $159 million grade-separation of Springvale Road. Yesterday I took a quick look around. Arriving on platform 2, it reminds me a bit of Box Hill, with part of the station being under the road, which means plenty of rain cover is provided. Note the low ceiling, and how close to the top of the train the overhead wires are — it would seem that we are destined to never again see double-deck trains in Melbourne, at least not on this line. Double-stacked containers would also be impossible (unlike, say, Laverton, whose dizzyingly high staircases allows space for them), which is likely to force the addition of extra tracks for freight from the Port Of Hastings, if that project gets off the ground. Update: I’m told double-stacked containers aren’t possible on electric lines, as the pantograph on the trains would need to be gigantic. The lower height is a blessing for passengers, of course – less steps. It appears provision for extra tracks will be on the southern side of the new line, where the original tracks were. The overall look of the station is less grey than neighbouring Westall. From pictures earlier in the week, it looks a bit miserable in the wet — but most stations do. Note the extensive use of grilled surfaces, I assume to help prevent tagging.